While my knowledge of Spider-Man stories is, at best, limited even I have enough knowledge of the Spidey mythos to know that The Amazing Spider-Man: Renew Your Vows #1 brings Spider-Man in an incredible new direction which is both innovative and compelling. 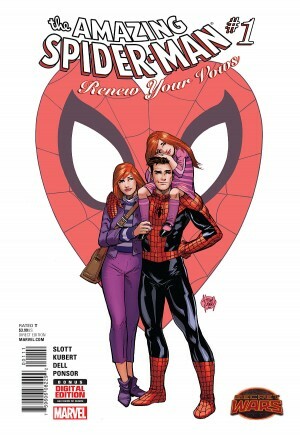 This issue focuses on how Peter Parker is happily living with his wife Mary Jane and daughter Annie. He’s balancing his family time with his crimefighting life, and things are looking up for our friendly neighborhood Spider-Man. But all is not well for long. Daredevil and Iron Fist are MIA! The Avengers are spooked about some Lex Luthor knock-off! There’s a prison break at Ryker’s Island! 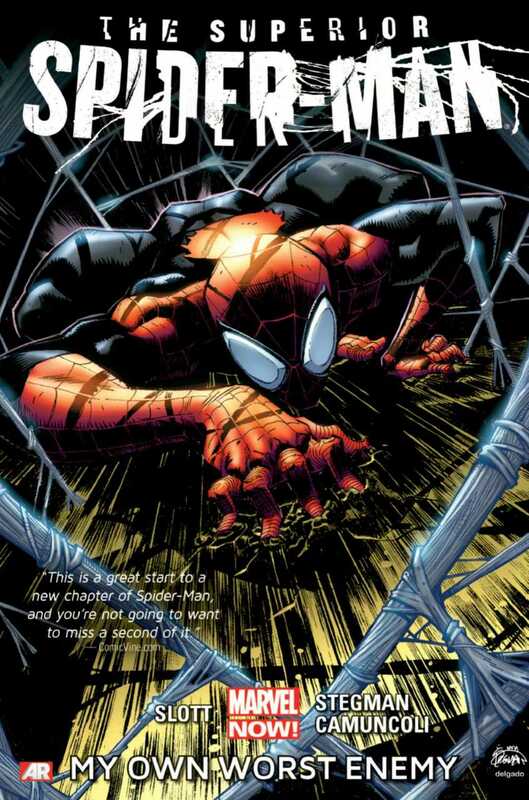 Worst of all, Spider-Man’s deadliest enemy has targeted the wall-crawler’s loved ones. Will our hero save the day? I was pleased to find out that little knowledge of the ever-controversial One More Day story is required to enjoy this comic. I know enough to understand that this is the Spider-Man story fans have been waiting for since that odious storyline was published. Nor is Secret Wars itself required reading, as proudly proclaimed on the first page. Beyond that, this issue gets nearly everything right. Peter Parker stays in character, given the new situation. Mary Jane and the rest of Spider-Man’s supporting cast are used well, though the latter are not featured prominently. The real villain of this issue, revealed about halfway through, is a perfect choice for the antagonist. I won’t say who it is for the sake of spoilers, but I will say that it would be a very different tone and even plot if it were anyone else. Mary Jane in particular is more than Peter’s love interest, to the point of almost being a second lead. She uses her head to do something useful, to help protect her child and to help Peter to save both their skins. Most of this issue consists of laying groundwork for what’s to come. In the mix of all that, however, is one wild card that hasn’t been seriously pondered since the end of The Clone Saga in the ’90s: Annie Parker. 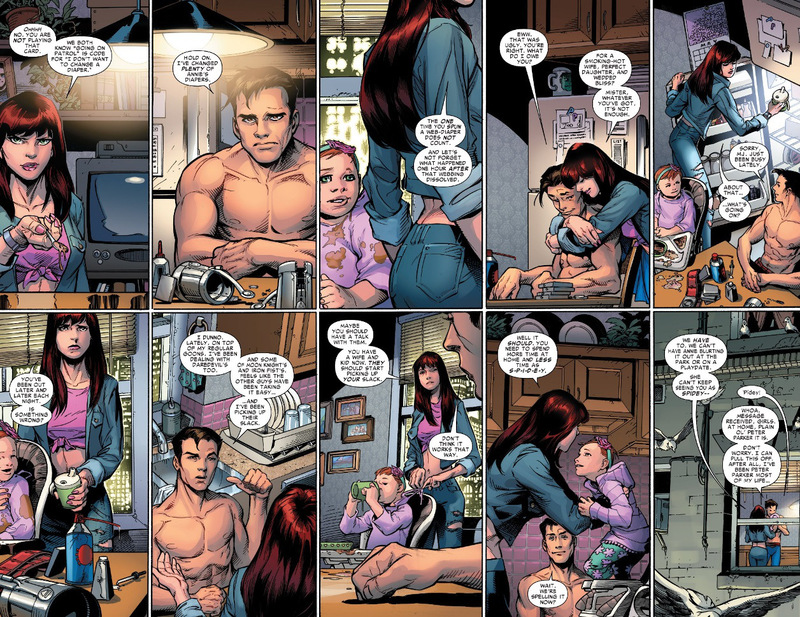 The idea of Peter Parker going on to start his own family isn’t entirely new, as evidenced by Spider-Girl several years ago. However, this issue lays the groundwork for a story that’s never been told before. 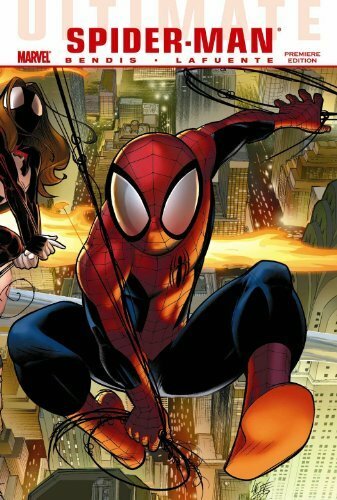 The aforementioned Spider-Girl was focused on the titular character, while here, the story is centered on Peter himself. The thing about Spider-Man is that he grows as the story grows. As he gets older, and naturally progresses into new phases of life, new thematic factors present themselves to be utilized in the comics. It was only when an attempt was made to turn the clock back via editorial mandate that problems occurred, resulting in a bad reaction from the fans. The Amazing Spider-Man: Renew Your Vows promises to be an imaginatively groundbreaking series which I will continue to follow. 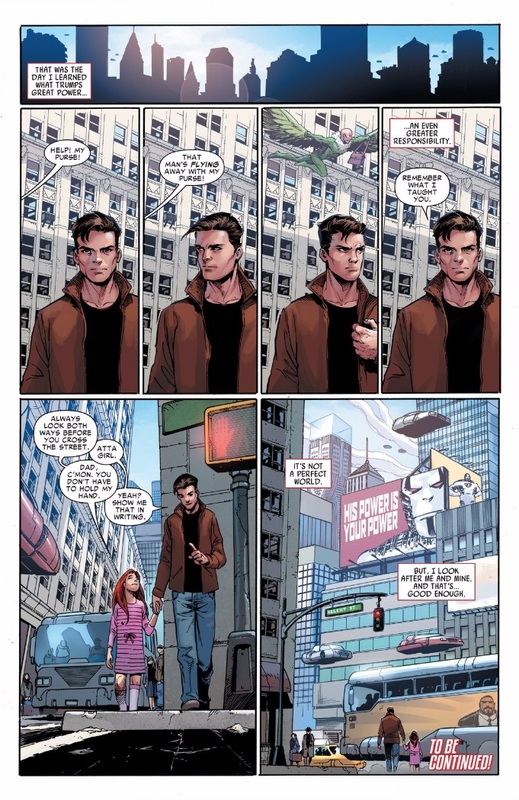 It not only brings back the Peter/MJ dynamic that we all know and love, but it throws in some refreshingly new takes on cornerstones of the Spider-Man mythos. Most importantly, Dan Slott, does all of these things quite well, not missing a single beat. A definite must-read. Image 1 from thepunkeffect.com. Image 2 fromcomicbookrevolution.com. This entry was posted in Uncategorized and tagged Adam Kubert, Dan Slott, Levi Sweeney, Marvel, Mary Jane Watson, Peter Parker, Spider-Man, Spider-Man: One More Day, The Amazing Spider-Man, The Amazing Spider-Man: Renew Your Vows, The Amazing Spider-Man: Renew Your Vows #1 on 07/23/2015 by primaryignition. The Superior Spider-Man is one of the few superhero titles I’ve ever read that really has the total package. It’s got action, drama, comedy, new characters, classic characters used in new and interesting ways, an agonizing predicament for our hero. In terms of a new Spider-Man series, there’s really not much more you can ask for. 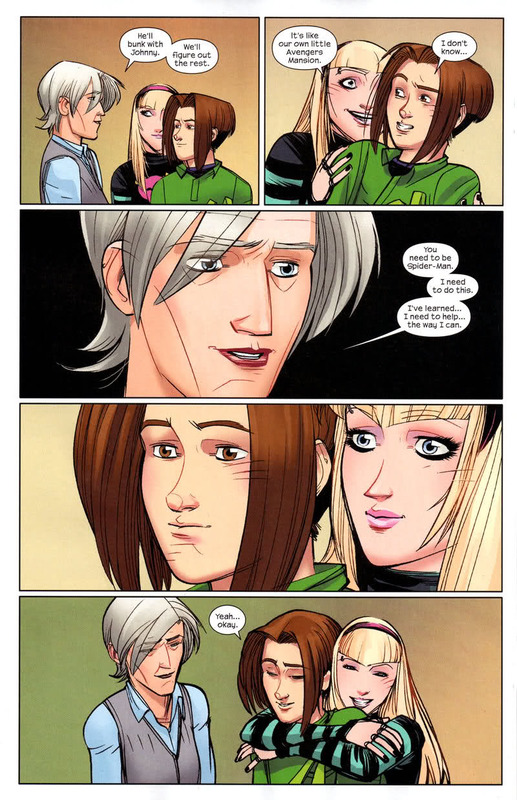 It’s a lot of fun to read The Superior Spider-Man. 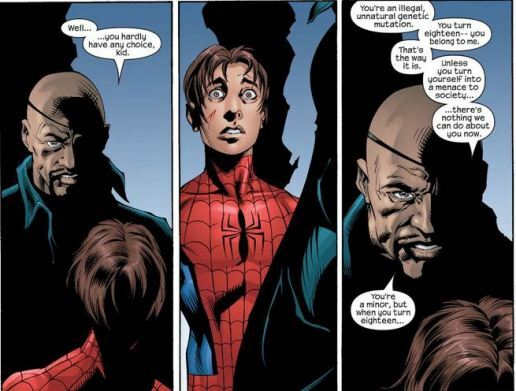 More than anything, what impresses me about My Own Worst Enemy is is the way Slott and the creative team use this predicament between Otto and Peter as a tool for both comedy and drama. In some ways, Octavius is very much the mustache-twirling supervillain here. he talks to his colleagues like they’re minions, when he’s in the lab he dresses like a mad scientist, and he lets the creepy supervillain laugh loose in public. He’s also more than a little excited about getting the girl, i.e. Mary Jane Watson. Some of the things Ryan Stegman does with Otto/Peter’s body language is great. But at the same time, there’s some pretty heavy stuff happening here. We flash back to Otto’s childhood traumas and see how they continue to influence him. He beats a few supervillains half to death, including his old pal the Vulture when they unknowingly hit too close to home. And inevitably, we get the “Why don’t I just kill the bad guys?” question. It’s great character work, and it humanizes Otto very well. We’re rooting for Peter, of course. But we’re also rooting for Otto to learn the correct lessons and do the right thing. Sometimes he does, sometimes he doesn’t. Such is the way of things, I suppose. One of my favorite Chicago area comic book writers, Dirk Manning, once wrote that Dan Slott was born to write The Amazing Spider-Man. As it turns out, he may also have been born to write The Superior Spider-Man. My Own Worst Enemy is a story which provides the darkness you’d expect from an in-depth look at a villain like Doc Ock. But it manages to balance it with the action and humor fans come to expect from good Spider-Man stories. And despite the controversy this series sparked, this is good Spider-Man. This entry was posted in Comic Books/Graphic Novels and tagged comic book reviews, comic books, Dan Slott, Dirk Manning, Doctor Octopus, Giuseppe Camuncoli, Marvel, Mary Jane Watson, Otto Octavius, Peter Parker, Rob Siebert, Ryan Stegman, Spider-Man, The Superior Spider-Man My Own Worst Enemy review, The Superior Spider-Man Vol. 1: My Own Worst Enemy, trade paperback reviews on 06/01/2013 by primaryignition.